Just like Friday night, the Screaming Eagles struck first, but this time it was en route to victory. With a 2-1 win on Sunday afternoon the Eagles have tied their best of seven series with the Rimouski Océanic at 1. The Eagles carried the tempo to begin the first period, while the Océanic generated more chances towards the latter stages of the frame. But neither team was able to score in the opening 20 minutes. There was action on the scoresheet though- Rimouski failed to score on the game’s first power play, and there was also a spirited and lengthy scrap between Cape Breton’s Roddie Sandilands and Rimouski’s Nathan Ouellet. In period two both teams would get a crack at the power play, with neither able to score. However, the Eagles did get the game opening goal at even strength. Mathias Laferrière won a battle with Radim Salda for the puck in front of the goal and beat Colten Ellis low along the ice. Just as was the case Friday, the Eagles carried a 1-0 lead into the third period. Cape Breton allowed very little in terms of scoring chances as the shots were 14-3 in favour of the visitors in the middle stanza. While the Eagles were able to keep the Océanic frustrated to begin the third period, the home side began to carry momentum as the period continued. But the Rimouski energy was halted when Salda was sent to the penalty box just before the 12 minute mark. 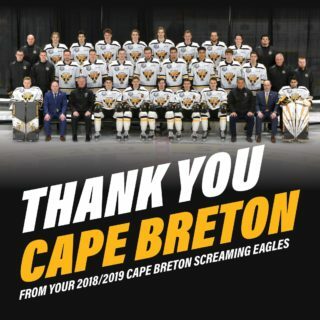 Cape Breton would employ a slightly more conservative power play, using two defensmen on the blue line, but it did not prevent the Eagles from producing multiple scoring chances. 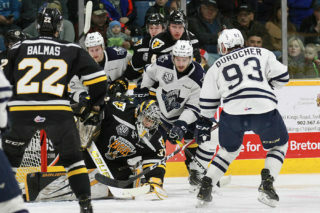 Ellis was able to make some stellar saves but couldn’t hold off the power play forever as Mitchell Balmas fired a shot through the Rimouski netminder’s legs to make it a 2-0 game. It was the first power play goal of the series for either team in a series that has featured little in the way of special teams action. 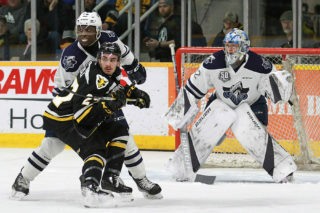 Down two goals, Rimouski got a breakthrough when Alexis Lafrenière received a pass from behind the net in front and was able to shovel it through the legs of Kevin Mandolese, who made many tremendous saves throughout the night. 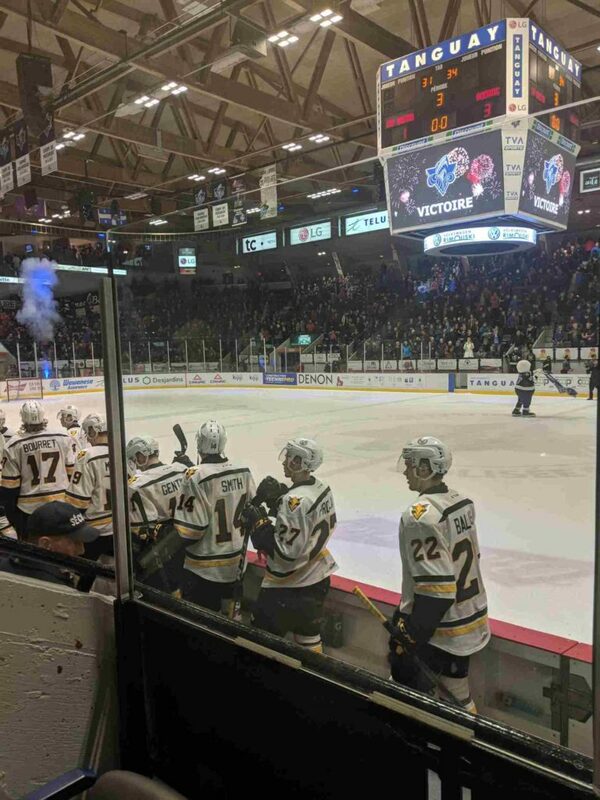 The Lafrenière goal came at the 17:44 mark, and following the goal Rimouski coach Serge Beausoleil immediately called a timeout to try to diagram a tying goal. With just over two minutes to play, Ellis was lifted for an extra attacker. 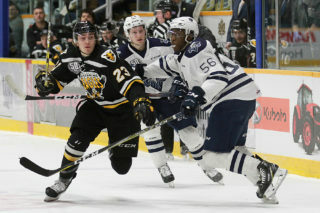 Despite sustained pressure Rimouski was unable to find a tying goal, and the Eagles took a 2-1 victory, becoming the first team to win on the road in round two of the QMJHL playoffs. Mandolese picked up the win, stopping 28 of 29 shots. Ellis was given the loss, turning aside 26 of 28 shots.